The final step before bottling your beer is called priming. Priming consists of mixing sugar in with the beer to carbonate the finished beer. The priming sugar will ferment and carbonate your beer. Before you can prime and bottle, you again need to sterilize everything the beer will touch. 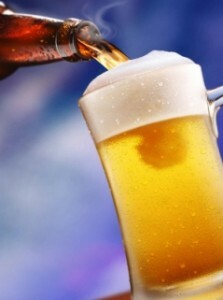 Though your beer has fermented out, it still can be ruined by bacteria or by adding too much oxygen to it (i.e. don’t splash it around). Most brewers use a large plastic bucket or carboy to make it easy to mix the priming sugar in evenly. Sterilize the bucket thoroughly, and also sterilize your siphoning equipment, tools and of course your bottles. Make sure your bottles are clean and free of debris before sterilizing – use a bottle brush to remove any deposits. Some people sterilize bottles by soaking them in a weak bleach solution and then rinsing well. I’ve also had some success with washing my bottles in the dishwasher, but you need to run it several times with no soap and hot water to avoid leaving a soap residue that will ruin the head retention on your beer. The most difficult part is waiting for your beer to come of age. While beers are drinkable after a few weeks, the average homebrew reaches peak flavor anywhere from 8 weeks to 15 weeks after brewing. Most homebrewers can’t wait this long. During the aging process your beer will carbonate and excess yeast, tannins and proteins that create off flavors will fall out of your beer and settle to the bottom of the bottle. This will substantially improve your beer. I personally recommend waiting about 3-4 weeks after bottling before sampling your first brew. Store your bottles in a cool, dark place. Unless you are brewing a lager under temperature controlled conditions, do not store your beer in the refrigerator for the first two weeks after bottling. Give it two weeks to fully carbonate at room temperature. After the first two weeks, refrigerating the beer will help it improve more quickly because the tannins, yeast and protein will sediment faster at cold temperature. The blessed day has finally arrived to sample your creation. During the aging process excess yeast, tannins and proteins will leave sediment at bottom of your bottle. Get a clean glass, open your brew, and gently poor most of your beer into the glass leaving only the sediment and a small amount of beer in your bottle. Don’t worry if you take a little sediment into the glass – it won’t hurt you. Smell the fresh beer, admire the frothy head, and then sip (don’t guzzle) your first homebrew. Hopefully this series will help many beginning brewers to get started with homebrewing. If you missed the earlier sections, here is part 1 and part 2 of how to brew your own beer at home. Thank you for your continued support of the BeerSmith Home Brewing Blog. If you have enjoyed this series of articles, consider subscribing to our blog for weekly email or RSS delivery. In the meantime, sit back, have a homebrew, and enjoy! My husband is crazy with beer, he drinks atleast 2 tins per day. I read your other parts regarding the Steps for Making Beer at Home.If I can make out in my home with the help of these article I am sure I can make my husband very happy!! sure i will make a try. During a recent bottling session, I started off by putting in my priming sugar solution in the bottom of an empty bottling bucket. I then siphoned in the beer from my fermenter using an auto-siphon and plastic tube. One thing I forgot to do once all of the beer was siphoned into the bottling bucket was to gently stir the beer. Do you think that the beer will still carbonate ok if I forgot to stir the beer to mix the priming sugar in? Will some of the bottles be flat and others over carbonated? Not sure what I’m going to get. If you put the sugar in first, very likely it will be fine as the siphoning will tend to mix things up as the beer is added. Likely you will have some variation, but I expect your carbonation to be pretty good overall. I am new to beer making and I noticed that my primary fermenter (open pail) has a lid, but does not have an airlock. Is this normal? I have read that other people have an airlock on them. I bought a beer and wine making kit from the company RJ Spagnols. Now my carboy (glass) has an airlock which is fine. You should have a hold in the pail lid to add your airlock, usually with a stopper. Hello , i saw some bubbles coming from the carboy ( plastic one) for few days and it stopped,does that mean my beer is ready to be bottled? ?Usually my room was hot during the day ; I never maintain the temperature. If the bubbles are slowing it usually means fermentation is slowing down. If you have a hydrometer, you can monitor the final gravity to see if fermentation is complete before bottling. i have been having a problem recently in that my beer doesn’t seem to carbonate properly and it has a “wine”ee taste. this really has me baffled. any idea’s? i add the yeast to the primary when the wort chills to like 70 degree’s and it sits in both primary and secondary at around 68 degrees. what does the mean corn sugar? Is the dextrose monohydrate ? Primary fermentation stage in a carboy with an airlock. Sie haben große Wahrnehmung, und ich werde auf jeden Fall das Lesen Ihrer anderen Blogs! I love making home brews. I have made about twelve different batches but I will admit not all of them have been great but we never skip the last step number 5 drinking!! Each of these steps definitely are important and all have their different tips and tricks to follow during the process. I have learned something new during each phase of making beers everytime I make a new batch, such a fun and addictive hobby lol. I run a pressure washing company so when I get home after working in the sun all day there is nothing better than to drink a home brew that has been sitting in the fridge waiting for you! Thanks for sharing your knowledge.